Minimum of 6 students required for the course to run. Students take home a recipe packet along with what they prepare. Examine various cooking methods as well as applications. Dry heat, moist heat, and combination methods will all be discussed and why we use them. Traditional and new modern cooking techniques will be used, such as sous vide. Within the course we will focus on specific dishes and understand the relationship between ingredients and method. 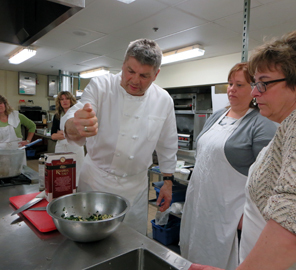 This is a great introductory course for cooking enthusiast or professionals. Minimum of 4 students required for the course to run. ServSafe-Certification Training for Food Service Workers through the National Restaurant Association Education Foundation. Learn knowledge and skills to prevent food, and safety-related incidents, improve food service operations, and reduce risk and incidence of food borne illness.